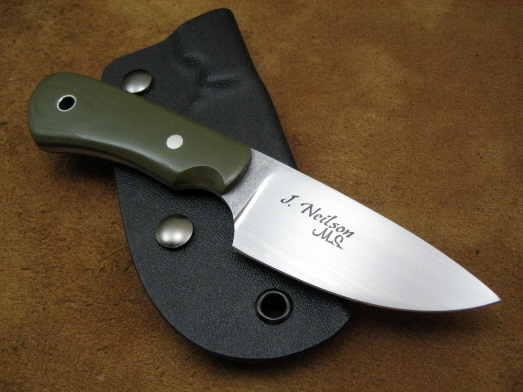 This page is devoted to the basic, no-nonsense knife in it's many varieties. All of these pieces are normally done with synthetic handles, satin finishes and Kydex sheaths with my removable/reversible belt loop.... normally. Of course, anything is possible. These knives make great EDC knives, Hunters, back-up knives... just great all around users. This is my standard B.U.K pattern (forged approx. 1/8" thick, 6" overall with a 2 3/4" cutting edge) but, is forged from my Ball-bearing damascus, which I forge from 1/4" 52100 ball-bearings and 1095 powdered steel done in a canister weld. The handle scales are Black G-10 with a stainless steel pin and lanyard liner (acting as the second pin). 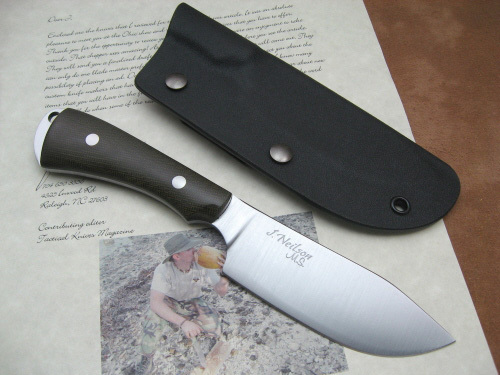 This knife comes with a with a molded Kydex sheath with a removable/reversible belt loop. This allows the knife to be carried on the right or left side...or remove the belt loop altogether for pocket or (adding a cord/chain) neck carry. This is a no-frills, no-nonsense, low-profile work knife. These B.U.K. 's are forged from 1/8" thick 1084 high carbon steel (6" overall with a 2 3/4" cutting edge) and have a satin or antiqued finish. The handle scales are 1/8" thick (normally Micarta or G-10) with a pin and lanyard liner as the second pin (either stainless steel or natural Micarta). 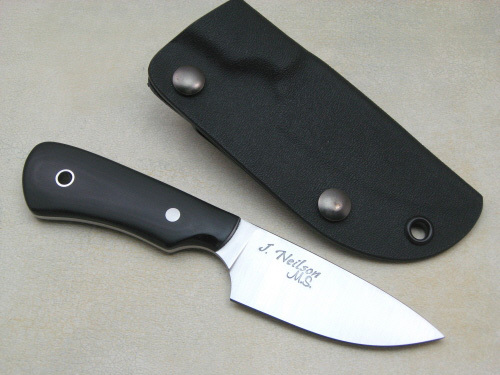 These knives come with a molded Kydex sheath with a removable/reversible belt loop. This allows the knife to be carried on the right or left side...or remove the belt loop altogether for pocket or (adding a cord/chain) neck carry. I will be doing these knives as time allows, with the all the replies I've gotten on this style, I'm sure I'll be doing at least a few each month. This B.U.K is forged from 1/8" thick 1084 high carbon steel (6" overall with a 2 3/4" cutting edge) and has a hand-rubbed finish and visible hamon/quench line. The handle scales are A-grade Desert Ironwood Burl with a stainless steel pin and lanyard liner (acting as the second pin). 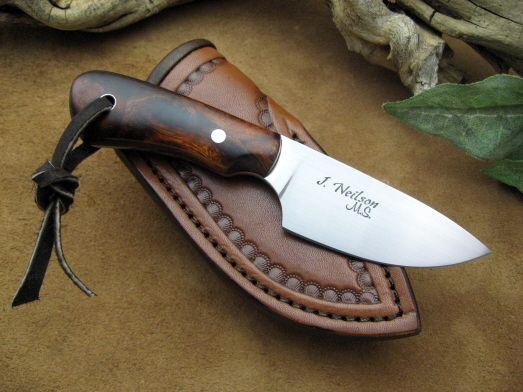 This knife comes with a border tooled leather pouch sheath with a belt loop. These B.U.Ks are forged from 1/8" thick 1084 high carbon steel (6" overall with a 2 3/4" cutting edge) and have a hand-rubbed finish with forge marked/acid soaked flats and visible hamon/quench line. The handle scales one this piece are 1/8" thick "Olive Green" G-10 with a pin and lanyard liner (acting as the second pin) in stainless steel. 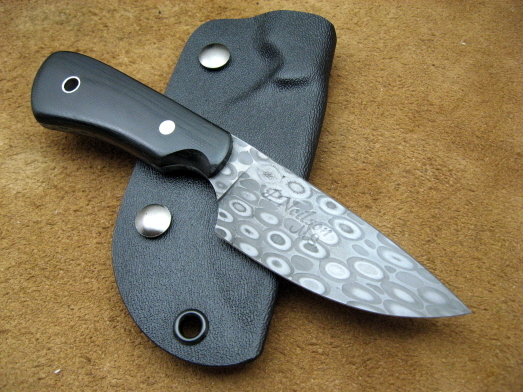 This knife comes with a molded black Kydex sheath with a removable/reversible belt loop. This is a larger off-shoot of my B.U.K. belt knife. These hunters are 8 5/8" overall forged from 3/16" thick 1084 high carbon steel. The knives have an edge-quenched, 4" cutting edge, an exposed pommel for hammering/pounding and comes with a brushed satin finish. The knives above are handled in Micarta and G-10 secured with stainless steel bolts. Each knife comes with a fitted black Kydex sheath with my standard reversible/removable belt loop. 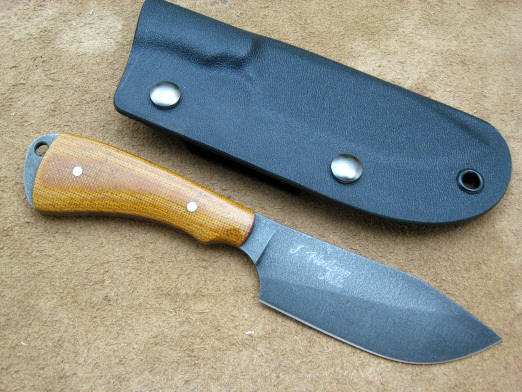 Basic Utility Hunting Knife "Junior"
This B.U.H.K.-Jr. is the same profile as it's big brother just reduced by 1/4 and forged from 1/8" thick 1084HC stock. This slim knife is 6 7/8" overall with a 3 1/4" cutting edge done up in a brushed satin finish or "antiqued" finish. The handle scales shown above are natural Canvas Micarta with a stainless steel handle bolts and exposed pommel/lanyard hole. These knives come with a molded Kydex sheath with a removable/reversible belt loop. This allows the knife to be carried on the right or left side...or remove the belt loop altogether for pocket or (adding a cord/chain) neck carry.